I was so excited when Clarissa released her book THE SHOLES KEY back in May. Not only because she was one of the few of my blogging buddies who wrote in my chosen genre and I could finally feel comfortable playing in my own backyard -- so to speak, but also because I was genuinely intrigued by its premise. Here's the back cover snippet. Newly-promoted Detective Inspector Theophilus Blackwell is assigned the case of Lorna McCauley, that at first seems to be a simple case of mid-life crisis and child abandonment. Elsewhere in London, MI5 analyst, Sophia Evans, is working undercover to catch an animal rights group responsible for targeted bombings. As her case (and her personal life) fall to pieces, she receives a strange envelope in the mail. It contains a picture of Lorna McCauley s lifeless face along with a daunting code. So, if I was so excited about this book, why did it take me three months to post this review? Well, it's certainly not the books fault because it delivered in full! Let's just say that work, life, blogging, and a shiny new ball of my own book idea, all contributed to the delay. But I'm happy to report that when I closed the final page on Clarissa's freshman effort, there was a smile on my face. In any genre, the characters have to come alive in order to ensnare the reader into the authors world, and not only do her two main characters achieve that goal, but her supporting cast do a fine job of rounding out the interactions and making them all believable. She deftly handles the sprinkling of humor amongst the heavier emotions and never stumbles with the multiple POV's. You care what happens to Sophia and Theo, and that is key (sorry for the pun). However, in the mystery world characters alone will not carry a novel to the finish line and a multilayer plot with a generous dose of twists and turns is to be expected...and here again Clarissa delivers. 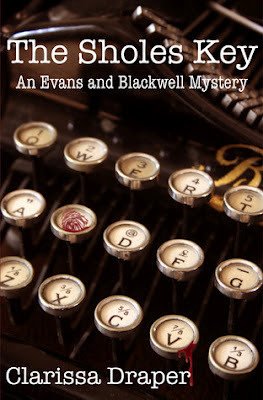 The mixture of MI5 spy tactics, everyday police procedural, and the code breaking exercise, did a great job of keeping this reader off balance and wondering what was around the next corner. Full disclosure compels me to say that there were a couple nit-picks that prevented me from bestowing a five-star rating for THE SHOLES KEY. There are a couple of coincidences that stretch believability (which I'm actually seeing in a LOT of mysteries now a days) and the ending left a few too many unanswered questions for my taste, but by no means should that over-shadow the entire book. I gave it a four-star rating for a solid reason...it is a great read and I'm looking forward to the next story in the series! Looking for a book to give both your brain cells and your emotions a workout...try this one on for size! I downloaded this book last week and am waiting to read it. The blurb drew me in and now after reading your review I think it will be the next book I will read. Will you put your review on Amazon as well? I notice there are two 5* and one 1* which is a bit disconcerting. Although to get 5* it would have to be pretty amazing. I didn't know about the one star review on amazon.uk until this comment and I went and read the review. I completely agree with it. I had to change a lot of the British spelling/terminology during edits and it bothered me a lot. I knew it would bother a lot of the British readers as well. I hope you find it doesn't bother you too much to get through it. Thank you very much for letting me know. LOved your honest review, and love the story's premise. This sounds like one for me. Definitely sounds like a great one to read, Don. My Kindle queue is getting too big: So MANY books, so little time! Great review, DL! I liked this book too. I've very happy with the review DL and all your honest comments. Thank you so much. Wow, this book sounds awesome!! I'm putting it on my list asap. I love anything to do with code breaking and spying. I haven't read many mysteries, mainly thrillers and historical fiction. However, after reading the summary and your review, I've decided to buy a copy. The premise sounds titillating. Thanks for taking the time to share this. DL, how wonderful that you wrote a balanced review and were so honest about how you left. It is difficult when you "know" the author, isn't it? Karen, I have done so much critiquing work in the past (getting and giving) that I'm used to bad remarks (and good ones). I actually find it really helpful to hear what my readers liked and didn't like so I know what my readers are looking for. Thanks for your comment. Hmm, that being said, I know a lot of writers that DO NOT LIKE to hear anything negative about their work AT ALL! I hope I never become like that. I love the X-Files vibe this mystery has. Congrats to Clarissa. Clarissa's book is on my wish list and I hope to read it. This is on my to be read list - thanks for the review!